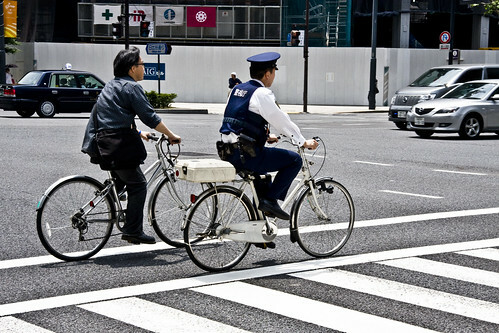 The police in Tokyo are equipped with these fine white bicycles. You'll see them lined up ever so orderly outside police stations. I never did figure out what was in the boxes on the back rack. First aid kit, perhaps? I like their style. There's no doubt they are law enforcement officers but a crisp, white shirt and a tie makes them appear not only stylish but accessible. I prefer seeing policemen and women who look like they are part of the society they are trained to served and protect instead of alienating themselves with strange costumes and man-made fibres. Like the new Copenhagen bicycle police unit.